Tha iomadh dòigh ann gus sin a dhèanamh. Tòisichidh mi leis an fheadhainn as goireasaiche. Chan eil sin ri ràdh gu bheil feum agaibh air fear ùr a cheannach. Feumaidh gach coimpiutair bathar-bog beag a dh'innseas dha mar a dhèiligeas e ris a' mheur-chlàr agaibh. Mar is trice, thig coimpiutairean ann am Breatainn leis a' bhathar-bhog airson UK Standard Keyboard. Ach gabhaidh sinn atharrachadh gu math furasta. 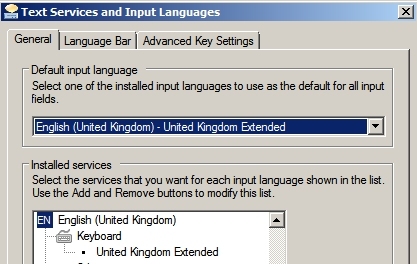 Ma dh'atharraicheas sibh sibh gu English UK Extended, 's urrainn dhuibh putanan marbha (deadkeys) a chleachdadh. Tha putan air taobh clì a' phutain 1 air an dà mheur-chlàr air a bheil stràc `. Ma leanas sibh ris na ceumannan seo, thèid agaibh air stràc a chur air fuaimreag sam bith ann am prògram sam bith. Cha bhi buaidh air rud sam bith eile ann ach gum bi na putanan marbha seo aig obair - cha ghluais rud sam bith eile. 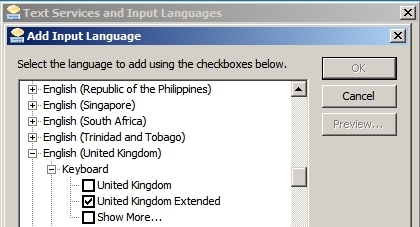 Le cromag ri Keyboard Layout/IME » United Kingdom (Extended) » Ok » Ok.
Taghaibh am meur-chlàr a stàlaich sibh mar Default Input Layout agus briogaibh OK. Sin agaibh e. Mar phutas sibh `agus an uairsin fuaimreag, gheibh sibh an stràc air an fhuaimreag sin. Le SHIFT, gheibh sibh an fheadhainn mhòra. 'S e an diofar eadar an dòigh seo agus CTRL + fuaimreag ann am Windows gun obraich stràcan ann am prògram sam bith le English (Ireland)/UK Extended/US International! Tha ath-ghoiridean mar sinn ann am MacOSX mu thràth. Gheibh sibh stràcan le ALT + ` + fuaimreag no ALT + ` + SHIFT + fuaimreag. Chan obraich seo air laptop! Tha dòighean eile ann ach seo an fheadhainn as fhasa ri an cleachdadh. Ma tha duilgheadas agaibh, feuchaibh am faigh sibh fuasgladh air an lìon an toiseach ach mura faigh, faighnichibh an-seo. Ma tha sibh ag obair ann an oifis mhòr no ann an sgoil, bi agaibh ri bruidhinn ri IT Support gus meur-chlàir ùra a stàladh. Tha treòir ùr air iGàidhlig ann.